American food manufacturers are keeping some of their best foods from your grubby little hands, like Christmas presents you'll never get to open. It's as if your real dad bought you an N64 back in 1996, and then moved to Canada to be with his other family you didn't know he had, and then gave that new N64 to his other kid. In this metaphor, that half-brother is Canada, and that N64 is an incredible Chips Ahoy! cookie stuffed with icing. 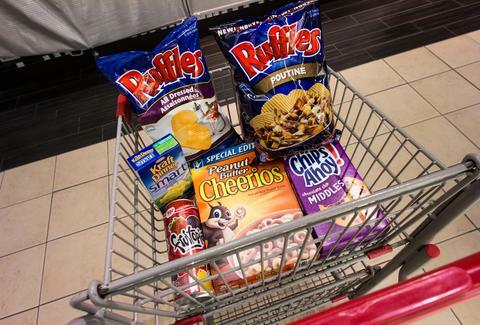 And that's just the tip of the Canadian snack iceberg. Which Countries Do Americans Love and Hate Most? If you've ever been in the ice cream aisle in the grocery store, you know Breyers. Caramilk is what Cadbury calls the Caramello candy bar in Canada. 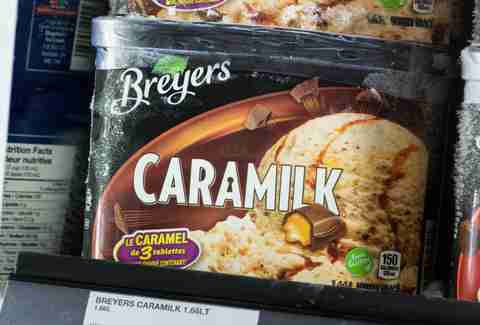 So Breyers Caramilk is Caramello that's all mixed up with vanilla ice cream. The company claims three of the caramel-filled chocolate bars are in every carton, and we believe them. Mainly because it sounds like a lot of work to eat an entire carton of ice cream and count how many candy bars were crushed up into it, so trust is important here. While I recommend you make all these poutine recipes, you also need to get yourself a bag of Ruffles Poutine chips. Seriously, get out of your chair, find your passport, and fly on a plane for these chips. How they get gravy and melted cheese flavors on a chip I will never know, but it tastes scarily accurate. I haven't been a regular Nestea drinker since my high school glory days. (Editor's Note: Can you be in marching band and have glory days?) But this mango green tea is a not-too-sweetened iced green tea in a huge ~23.5oz can that I'd be picking up if it were available here. 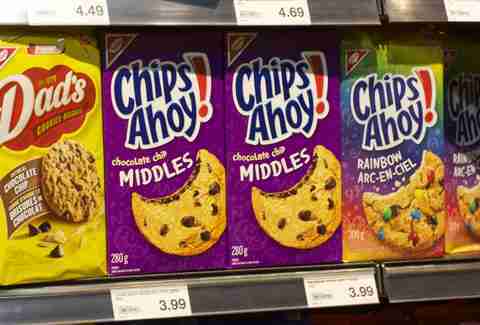 All of America's obesity statistics seem to point to the fact that we have the snack game on lock, but without Chips Ahoy! Middles, we will never reach our full potential. Imagine a soft-baked cookie with a layer of chocolate frosting inside. If you are not warm and tingly inside after reading that sentence, then good. You're dead inside, and I have more cookies to eat when I cross the border. While I silently judge myself every time I mix the bright-orange powdered dairy substance into my mac, Kraft in Canada has figured out how to make 34-year-old dudes feel better about eating like they’re still in college: tack on the Smart label. The Canadian mac & cheese has oats and a high fiber content so everyone can tell themselves they're both healthy and intelligent when eating a bowl at 10:30pm on a Tuesday. Sure, America has Multi Grain Cheerios Peanut Butter, but Canada has straight-up peanut butter in regular Cheerios. 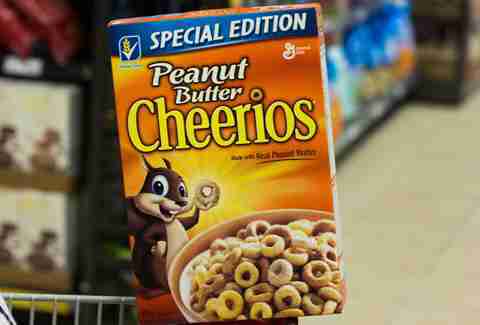 The Canadian box has a happy squirrel on it, an animal obviously hopped up on Peanut Butter Cheerios, while the American label looks like food your doctor is making you eat because you need to get healthy. Get it together America: when Canada's products are more indulgent than ours, we should worry for our dominance of all things gluttonous. While there is no direct American analog to the All Dressed chip, the flavor is like a combination of all our greatest chip hits with garlic, salt, onion, vinegar, and BBQ all on one deliciously ruffled platter. This is the chip America wants and the chip America needs. What's the brand Coca-Cola killed 10 years ago doing in Canada? Did it move North after graduating high school? Nope, turns out it's still available here and Australia. And it should be available in America too, because the apple/pineapple tallboy can reminds me of every juice box drink I had way back then. Each sip is a time warp. Lee Breslouer is a senior writer for Thrillist, and is mad at Chips Ahoy! for keeping those cookies from us. Follow him to cookie protests at @LeeBreslouer.